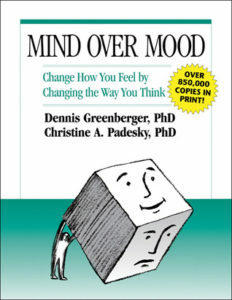 [by Dennis Greenberger, Christine A. Padesky, Aaron T. Beck (Foreword) | Guilford Press 1995] Developed by two master clinicians with extensive experience in cognitive therapy treatment and training, this popular workbook shows readers how to improve their lives using cognitive therapy. The book is designed to be used alone or in conjunction with professional treatment. Step-by-step worksheets teach specific skills that have helped hundreds of thousands people conquer depression, panic attacks, anxiety, anger, guilt, shame, low self-esteem, eating disorders, substance abuse and relationship problems. Readers learn to use mood questionnaires to identify, rate, and track changes in feelings; change the thoughts that contribute to problems; follow step-by-step strategies to improve moods; and take action to improve daily living and relationships. The book’s large-size format facilitates reading and writing ease.